On the 63rd commencement, in recognition of their valuable and limitless contributions to the country, Addis Ababa University has conferred Honorary Doctorate Degree on four individuals. First recipient is the world renowned Athlet Tirunesh Dibaba. The University conferred on her Honorary Doctoral Degree of Humane Letters honoris causa for her outstanding performances on different national and international track and field athletics competitions. In recognition of the outstanding works of the distinguished Italian Scholar, Prof. Angelo Del Boca, who greatly acclaimed numerous published works carried out with exemplary objective meticulous research, the University has conferred on him the degree of Doctor of letters honoris causa. Similarly, the University has conferred Degree of Humane Letters honoris causa and the degree of Doctor of Sciences honoris causa on Artist Tesfaye Abebe and Dr. Clare Pain respectively. Guest of Honor, H.E. 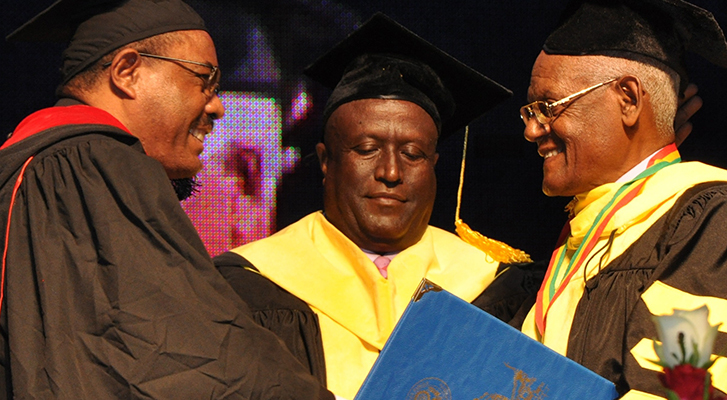 Ato Hailemariam Desalegn has handed out the honorary degrees and awards and hooded the awardees.